You’ll wear ten-dollar shoes and eat rainbow pie. So what’s this self-professed and proud-of-it “redneck” do? This memoirist combination John Steinbeck, Michael Harrington, Henry Thoreau–with a funny bone to wallop your gut—what’s he do but produce the best book on the unsung 60 million (cozened to vote against their own self-interest, fodder for corporations’ wars)—write the best book on them that anyone of his generation has written! Bageant knows the territory like the back of his ham hocks. Now a frequent guest on NPR and the BBC, Bageant has had his journalism and commentary in periodicals and at websites around the world (check out www.joebageant.com for a compilation). His first book, Deer Hunting with Jesus: Dispatches from America’s Class War, announced to the literate world: here’s a thinking writer who can make you cry with the tenderness of his character depictions of the real folk, and make you livid as he shows how their “operative community democracy” was sliced and diced by corrupt media, religious charlatans, and, yeah, the military-industrial complex. Deer Hunting is an excellent book. Rainbow Pie is even better. 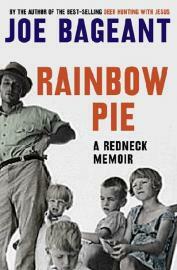 Rainbow Pie is about now; Deer Hunting laid the groundwork, sowed seeds of memory for this West Virginia-born sui generis intellectual. Rainbow Pie brings those seeds to fruition amidst our present devastation—the “financialization” of the “transactional economy.” Translation: outsourced jobs; debt and desperation in the homeland. Now mid-60ish, Bageant’s witnessing is astute and acute; he’s been there. “When World War II began,” he writes, “44 percent of Americans were rural, and over half of them farmed for a living. By 1970, only 5 percent were on farms. Altogether, more than twenty-two million migrated to urban areas during the post-war period.” And they engendered children and grandchildren who swelled their ranks by another 40 million—uneducated rural whites and their descendants who form the foundation of “our permanent white underclass,” outnumbering, btw, the other poor/working poor—the Hispanics, blacks and immigrants. “Even as the white underclass was accumulating,”Bageant writes, “it was being hidden.” Hidden or ignored in the universities…, and caricatured and cartoonized by the media merchants—Beverly Hillbillies then, King of the Hill now! “The official version of all life and culture in America is written by city people,” Bageant avers. It happens perhaps once or twice every August: a deep West Virginia sundown drapes the farmhouses and ponds in red light, as if the heat absorbed during the dog days will erupt from the earth to set the fields afire. “Eternity” may not care. … But in Bageant’s mighty and tender hands, we do. This article was posted on Wednesday, March 23rd, 2011 at 8:00am and is filed under Anti-war, Book Review, Classism, Culture, Poverty. Gary, thanks for this. Hope Joe is feeling better. Best wishes to him, all success and great health! When I think of Americana, I think of Joe Bageant. Not many can write like him or ever will. A very special talent for story telling made up of experiences so thick you could eat em with a fork. Fred Reed comes to mind… I’ll bet they’re friends. I can just see them sitting on Fred’s roof in Mexico drinking that Padre Kino, laughing and joking and just sitting there kinda quiet like. On this sad day when we heard of Joe’s death, I just wanted to pay tribute to him. I heard him speak in London a couple of years back when he was on his Deer Hunting with Jesus tour. He left an indelible impression on me as he explained how so many Americans had been sidelined by AMERIKA when they had left their farming roots and then the work had gone. It seemed that you could either die of disease contracted in the coal mines or you joined the military and became fodder for the military industrial complex and thus unwittingly a killing machine. I can still hear Joe’s voice. He signed my book ‘In Art and Labor’. God bless him. I also wanted to thank Gary for this review of his late friend’s book and also for his articles, poems and comments on this website over the time I have been visiting it. It is a shame that the interface between author and reader is being taken away (why? please think again Eds). Gary’s work and comments have always elucidated and informed and also entertained! When I posted my earlier comment Joe was still with us albeit very ill and I truly was hoping for the best. Now I’ve got a tear in my eye, feel a little sad in my heart. Thank you, Mary and Kalidasa. A sad day in a sad year. The loss–to humanity–of a unique voice, heart and talent. But… let us find comfort, wisdom and even joy in the work he has left as his testimony.